Leaving a job without burning bridges and with references in tact is difficult, especially when you are jumping ship for a better position elsewhere. But what about when your current employer doesn’t just sit back and let you leave? Once you’ve found a new job, you enter into a transitional state as you prepare to enter a new environment with new responsibilities and expectations. So, what do you do when your old job decides to give you a counter offer? Once the offer is on the table, you may be tempted to take it since it probably offers many things you always wanted out of your job (e.g. higher pay, more vacation, better benefits). But before you say yes to your would-be past employer, there are things to consider and a few steps to help make turning down the offer easier. First of all, remember that there is a reason you decided to leave your job in the first place, and your employer may have just figured that it was less expensive simply to keep you around than to recruit, hire, and train a new employee. When considering a counter offer, look it over carefully and make sure it is the best decision for helping you reach your career goals. The more doubts and reservations you have, the more likely you should decide to reject the offer. If you decide to turn the offer down, the issue becomes how to approach the situation to ensure a continued mutual respect. If you sense and undercurrent of negativity or spite in the offer, don’t let your emotions get the better of you by remaining professional and remembering that a good reference in the future is worth more than the temporary satisfaction of a petty revenge in the present. The best approach is to meet with your boss face-to-face and deliver a formal rejection in person. An alternative method is to write your rejection into your resignation letter. Remain respectful by thanking your employer for the offer, but politely turn it down. Regardless of your feelings toward the offer, whether you are flattered or offended, the break from your employer need not be damaging to your professional relationship with your boss and senior management. 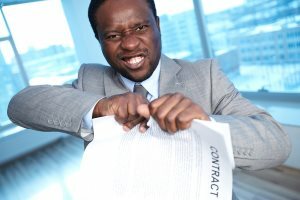 Accepting a counter offer may seem tempting in the short run, but it runs the risk of revealing a number of negative consequences in the years ahead. Always remember that you have chosen to move on to a different setting and position in order to continue to grow as a professional and expand your skill set as you become an ever more valuable employee.